From the best tradition of Alba and the Langhe hill, we offer this product very classic but appetizing. 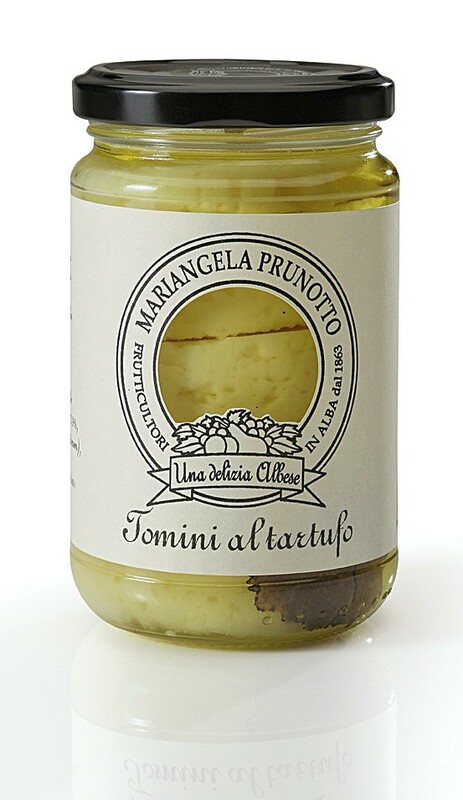 The Tomino, matured and produced with cow’s milk, is preserved in olive oil flavored with truffles. It can be a tantalizing taste great appetizer or a delicious end meal. It is exalted when grated over pasta. The Tomino cheese is a little known but perhaps in terms of goodness has nothing to envy to other much more’ known and advertised. The Tomino is ‘considered a typical cheese from Piedmont only a short time, with only the Italian dairy recently have considered both the entities’ production for both qualitative advantages. “Tomino” literally means “little toma”, although the two cheeses have nothing in common except the region of origin: Piedmont. The name derives from the term Piedmont “tuma” which means the fall and that would indicate that the precipitation of the casein undergoes the action of rennet. In the Piedmont Dairy Tomino and ‘a very important not only in terms of quantity and quality but also in economic and social development. The Tomino is consumed mostly fresh and comes in the form of a small disc with flat sides of the diameter of 4-8 cm and 1-3 cm with a heel of white paste, porcelain, soft and crumbly, sweet and mild, acidic and pleasant. It can also be subjected to a short seasoning period of 15 -30 days during which it forms a thin outer crust covered with white mold and the taste becomes stronger and more aromatic. Ingredients: Tomino (milk, salt, rennet), olive oil, truffles (tuber aestivum), flavour.